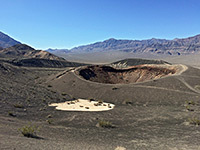 An unusual addition to the great variety of geological features in Death Valley National Park, the Ubehebe Crater system contains several volcanic craters, cinder cones and ash hills, all relics from an explosive steam eruption about 2,000 years ago, when rising magma met an underground lake. Ubehebe is by far the largest crater, 2,400 feet in diameter and 500 feet deep, and presents a very colorful spectacle with variegated, buckled strata around its sides and grey-black ash on the rim - especially pretty at sunset or sunrise. 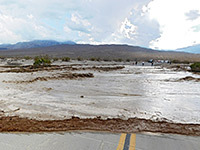 The region is located in the far north end of Death Valley, reached by a spur road off CA 190, just before the highway turns east and exits the park near Scotty's Castle. Map of Death Valley National Park and surroundings. 9 views of Ubehebe Crater. Panorama of badlands in the canyon. The paved road to the crater ends at a parking area on the north rim, though an unpaved road continues, bending back south and heading towards various remote back country areas including the Racetrack, where large rocks roll seemingly unaided across a dry lake bed. Ubehebe Crater has a trail around the rim and a steep path down, though this does not look too exciting and certainly photography is best done from rim level. 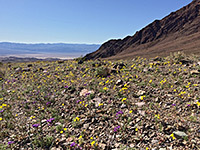 The crater is even more colorful in spring, when yellow and purple micro flowers grow amongst the jet black ash on the upper slopes. Other paths wind through more cinder cones and craters, such as the much smaller Little Hebe Crater, which cover an area of several square miles to the south.